As we only have 12.5 hours and 1 extra second left in 2008, I thought now would be a good time to list the top 8 news stories of the past year. This list is subjective (as all lists on my blog will be) and reflects which stories interested me most over the last 12 months. In looking back at these events, 2008 has to rank as the most newsworthy year of the decade thus far. 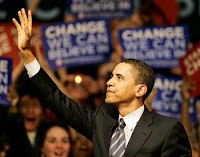 I admit that I am buying into the hope hype that Barack brings to the table. I'm glad that 2009 will bring an end to the Bush/Clinton reign and give an injection of youth and fresh ideas into the country's government. I think the most significant immediate change from the Bush administration to the Obama administration will be seen overseas. Other countries will view the USA in a much more positive light with a competent and engaging Commander in Chief at the helm. I'll lump all of the bailout, banking and Wall Street stories into the most depressing topic of the year. The real economic trend for 2008 was volatility. During the past year gas jumped up all the way to over $4 a gallon and now sits well below $2. While down significantly from the close of 2007, the Dow Jones industrial average experienced record single-day gains AND drops. We watched most of Phelps' wins down at the Jersey Shore on vacation. It was great to be able to see so much of the Olympics (especially the swimming) at night when the kids went down. I saw most of Phelps' races live and between the close finishes and the overall endurance of the effort, this was without a doubt the greatest Olympic feat I've ever witnessed. This is a story that makes this list only based on events that occurred a few days AFTER Tiger received the US Open trophy. It wasn't just amazing that he roared back with two super clutch putts to beat Rocco Mediate at Torrey Pines in June. It was utterly incredible that he made that comeback on a leg with a torn ACL and a stress fracture. Shut down until the Masters next May, Tiger proved once again that he's the greatest athlete of my generation. Side note: Did you realize that December 30th (yesterday) is both the birthday of Tiger Woods (now 33 like me) and Lebron James? Talk about a day you want your son to be born on if you're a sports-enthused dad. I was never a fan of Sarah Palin and did not think she was at all qualified to assume the post of Vice President of the United States of America. She did seem to garner a lot of (undeserved) attention though and become a cultural icon of 2008. Tina Fey's spot-on impersonation probably helped fuel the fire. I'm betting we say a where-are-they-now piece on Palin sometime next decade. There are a few news events in a lifetime where you can remember exactly where you were when you heard the news. While this is not one of the significant ones in the grand scheme of things, I vividly remembered riding an elevator at Safeco Insurance in Seattle (my client at the time) on a cold January day and looking at the news LCD screen they have embedded in each elevator. The breaking news crawl on the top read that Heath Ledger had died in NYC. This was very unexpected and unfortunate as he was just about to become a major movie star. 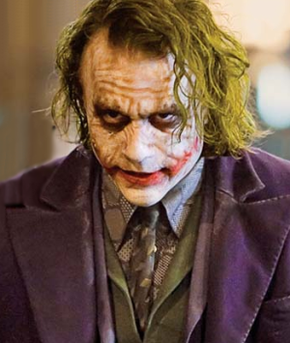 His last performance in The Dark Knight should earn him a well deserved posthumous Oscar in February. A painful reminder of how sick some people are and their need to resort to senseless violence and terrorism to prove a stupid point. Another Olympic achievement rounds out my personal list. 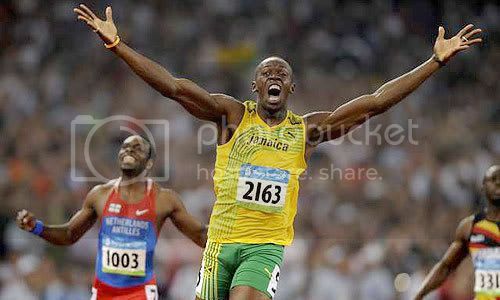 Bolt completely toyed with the rest of the field in Beijing, redefining the sport of track and field. What is mind-blowing is that he would have absolutely shattered the world record in the 100m dash if he raced hard through the whole race. For someone who doesn't like it when people misspell his name, you sure did a fine job with Sarah Palin's. You stink.